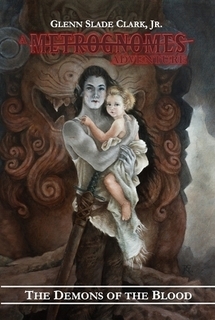 The idea for The Demons of the Blood began with a reference to one of Malik's earlier adventures in the novel Metrognomes: The Shaman's Apprentice. The Demons of the Blood was originally planned as a short story but ran much longer than expected. The character of Ronan Kah was not in the original outline. When the character appeared in the manuscript and went along for the journey, the outline was expanded to include him, balancing the cast in a way that turned out to be essential. When the decision was made to publish the novella as a hardback, the subtitle "A Metrognomes Adventure" was added to differentiate it from the main series which began with Metrognomes: The Shaman's Apprentice. While The Demons of the Blood does take place fourteen years earlier in the same universe and shares some characters with the original novel, it is a spin-off, not to be mistaken for Book II of the main series. The book almost did not include illustrations. 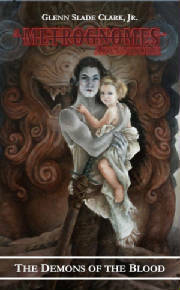 The idea was for The Demons of the Blood to be visually differentiated from The Shaman's Apprentice, to help support the idea that this was not Book II in the main series, but a self-contained story in the same universe. When illustrations were commissioned, Paige Carpenter was brought on board to create art that would appear beneath the chapter headings. During the design process, however, the illustrations were placed alongside events they depicted in the story and given much more prominence than originally intended. Paige's work and the one-illustration-per chapter rule still successfully set the book apart from the main series stylistically. The Demons of the Blood: A Metrognomes Adventure was published in hardback on October 18, 2016, in trade paperback on October 30, 2016, and in e-book format on December 27, 2016. The book was released in pocket paperback format on October 3, 2017.